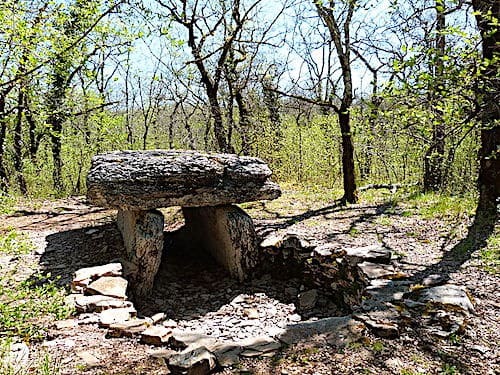 You'll find the Dolmen du Bois de Galtier in Martiel, a municipality of Aveyron that has the highest number megaliths known to date. Indeed, Martiel boasts so far 30 dolmens, located in the north and east of its territory; however, many others are most likely still buried in the vegetation. Their funeral furniture was alas looted during unguarded excavations carried out in the 19th century, when the trend of antiquities was at its peak. However, more recent excavations confirmed that these dolmens were erected between 2500BC and 1800BC. The three most complete dolmens are classified historical monuments: dolmen du Bois de Galtier, dolmen Marie-Gaillard and dolmen Delves. The first inventory of their funeral furniture was carried out in the late 19th century and the finds sent to the local museums. These include pottery with geometric patterns, pierced stones, bronze needles but also many arrowheads; the latter led archaeologists to believe that these ancient folks were at war (most likely territorial) with their neighbours. The dolmen du Bois de Galtier is one of the many dolmens that dot the 9,5kms pedestrian discovery trail created by the municipality of Martiel. Its tumulus has almost entirely disappeared. However, what is left shows that it was round (with a diameter of 20m) and had a 1.20m wide sepulchral chamber. Excavations carried out in 1900 uncovered 3 arrowheads, fragments of a stone ax and a bronze dagger, 10 copper annular beads and 27 human teeth. Le Dolmen du Bois de Galtier was classified Historical Monument in 1889. 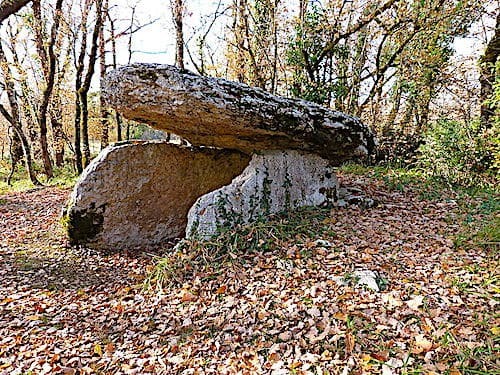 The dolmen Marie-Gaillard, which is also known as Les Teyssounières, was classified as a historical monument in 1978. It was originally buried in a 15m round tumulus, but was converted into a rock shelter at a later date. A small dry stonewall, which looks like a chimney, was indeed erected in the sepulchral chamber, between the closing slab and one of the supporting stones. Late 19th century excavations brought to light a metal pin, a shard of pottery and a perforated limestone. Along the trail, you’ll also find a tiny 40cm round and 10cm deep basin in the vicinity of one of the dolmens. Locals call it 'wood basin' as its bottom is imprinted with tree-rings patterns. The ancient folks who created it (and erected the dolmens) used the base of a cut tree trunk to press into the local soft clay; the clay dried and hardened over time retaining forever this unusual pattern. You’ll need to download the free PDF - GPS map to discover the dolmens scattered along 'Martiel discovery trail' as the marking is quite basic.